Randy Gage is the author of 8 international bestsellers and his new book is slated for a much anticipated release later this month. 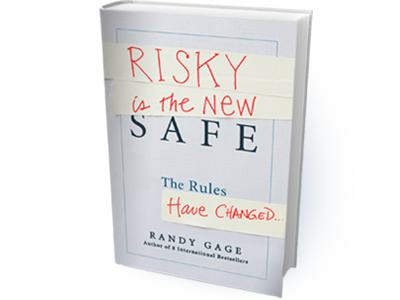 He will be on to discuss why Risky is the New Safe, why the rules have changed, and how to live with the new reality. Randy Gage has helped people shatter their self-defeating limiting beliefs to achieve success and prosperity for over 20 years. He helps people uncover subconscious programming that causes them to sabotage their own success, and replace it with beliefs that allows them to succeed. Randy's been called "the millionaire messiah" because he believes you were born to be rich. His "Deepak Chopra meets Dennis Miller" style offers straight talk on how to harness timeless spiritual principles to manifest prosperity. The lessons he teaches are the result of his own journey from high school dropout to multi-millionaire. Randy is the author of eight books and dozens of audio and video resources on success that have been translated into more than 25 languages and sold millions of copies around the world. His new book, Risky is the New Safe, due out Oct. 30, has been called "a manifesto of individual and global magnificence."